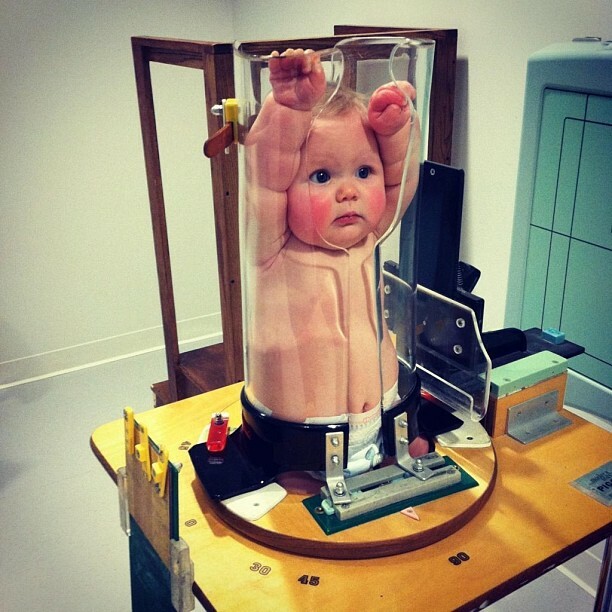 No, this is not a picture of a baby stuck in a giant test tube. Of course this image of what looks like a baby trapped inside some crazy test tube contraption is going viral. And no, it hasn&apos;t been photoshopped. What you&apos;re seeing here is actually a pediatric X-ray machine—with the unfortunate name of Pigg-O-Stat—and apparently, this thing is the bomb.com. See, exposure to radiation at a very young age is a pretty solid concern for both medical professionals and parents. Which is why getting a baby&apos;s X-rays taken quickly and accurately is super important. But it&apos;s not always easy, given that infants are fairly unpredictable and like to wiggle around. That&apos;s where the Pigg-O-Stat comes in. Described as "an all-in-one pediatric immobilization device designed for positioning infants and young children for an appropriate x-ray without significant complications," the machine gives the technicians in charge the best chance of capturing a great pic on the first shots. And fewer retakes mean less exposure to radiation for the beautiful baby. So it&apos;s basically a win-win. But it still looks weird, which is why this picture was posted to Reddit with the simple caption "A baby getting an X-Ray looks hilarious." "I hope the teller sends a lollipop back with deposit slip!" wrote one commenter. "Imagine opening one of those pilsbury biscuit cans and have this pop out at you," added another. "That&apos;s not an X-ray," explained a third. "It&apos;s a TSA screening. That baby forgot to take his keys out of his pocket." Mad props for the creativity. Though several radiology techs also stopped by to helpfully explain what&apos;s really going on. "It might look hilarious, but it&apos;s a damn life saver," said one. "I use one every time I do a chest X-ray on a baby. Its use is to immobilize the child so that they don&apos;t wiggle around. It might look scary, but it saves me from repeating my images and excess radiation." "Is it hard for parents to watch?" added another. "Yes—it can be. But in all honesty, I&apos;ve had just as many parents pull out their cell phones to take pics to share with friends and family as I have had parents who get emotional." "Rad tech here," offered a third. "As much as we&apos;d love to still use those things, a lot of bigger hospitals are outlawing them. Apparently it&apos;s just too intense for the parents to watch. I wish we could still use them however is because it reduces motion, which reduces repeat X-rays, which reduces radiation exposure to the baby. Hell, I wish we could use them on adults too." And finally: "I'm an x-ray tech," said a fourth. "The disturbing fact: The more they cry the better the picture. Because their lungs are full of air in between screams....we are terrible people." Learn something new every day, kids! Though the biggest takeaway here might just be the fact that if you're looking for a radiology tech, you can probably find one hanging out on Reddit.